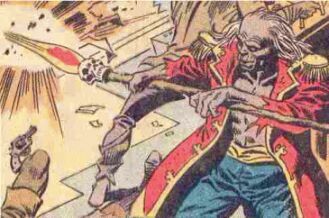 Powers: Baron Samedi's greatest power is his flair for the dramatic; he wields a staff that can fire laser beams. 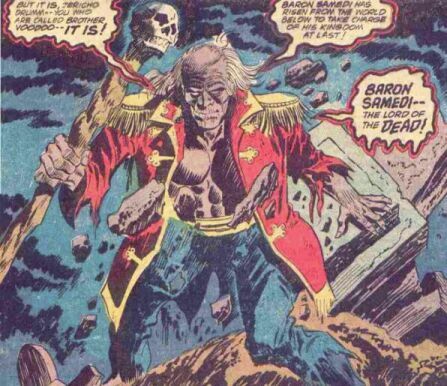 History: (Strange Tales I#171 (fb))- Baron Samedi, an agent of AIM, established a base in Haiti beneath a graveyard. With their Mind-Mechanism, AIM gathered local people and transformed them into zombie-like creatures, with little will of their own. Then, they went on raids of local factories. On one such raid, one of the zuvembies was captured, and recognized as the dead brother of the plant's owner. (Strange Tales I#171)- Brother Voodoo was alerted to Samedi's raids, and viewed the captured zuvembie; a pathologist from the United Nations was summoned to Haiti to examine him. (Strange Tales I#169 (BTS))- As the pathologist arrived in Haiti, agents sent by Samedi attempted to kidnap him, but Brother Voodoo arrived and defeated them. 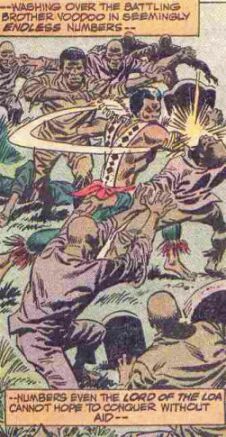 (Strange Tales I#171)- The pathologist recognized some of the dirt on the zuvembie as coming from a grave, and so, Brother Voodoo journeyed to the local cemetery. There, he fought Samedi's army of zuvembies, and was brought down by their sheer numbers. After coming to, Brother Voodoo found himself strapped to the Mind-Mechanism. Samedi explained what AIM had been up to, and used the device on him, so that he would join his army of "the undead". 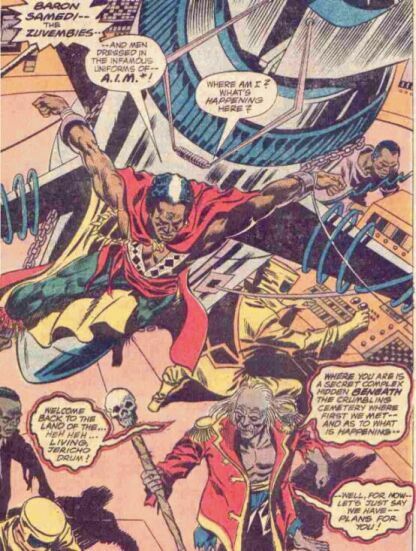 However, Brother Voodoo feigned compliance, while a lizard under his control chewed through the machine's wires. Destroying the Mind-Mechanism freed the "zuvembies," returning them to normalcy. Brother Voodoo ordered them to the surface. Samedi tried desperately to kill Brother Voodoo, but a stray blast from his staff accidentally brought down the Mind-Mechanism upon himself, crushing him. The entire base then collapsed. Comments: Created by Len Wein and Gene Colan. The best word to summarize Baron Samedi is: unsatisfying. For an AIM agent dressed in a bandleader's costume who leads an undead army, he's not very colorful. So, if Samedi's zuvembies were all mind-sapped people, why'd the factory owner recognize one as his brother who died 6 months earlier? You'd swear a completely different person wrote the second half of this story. And boy, the Haitian accents in these books are awful. Everyone talks like the Kingfish. And as our own Bill Lentz reminds us Samedi is French for Saturday. The Mind-Mechanism was an enormous machine that could drain the minds of men, making them compliant to AIM's commands. When Brother Voodoo destroyed the machine, all the affected zuvembies were returned to normal. All characters mentioned or pictured are  and © 1941-2099 Marvel Characters, Inc. All Rights Reserved. If you like this stuff, you should check out the real thing!